Why choose Cortekx, and Acumatica? With Acumatica Cloud ERP software you impact the bottom line because you are able to do more in less time, accurately. Anywhere, anytime on any device gives you the freedom to be where you need to be and just a click away from information you need to make important decisions. Unlimited Users allows you to choose who gets access and to what..
Keep your finger on the pulse of your business. You know where you are and where you want to go at every moment. Mold Acumatica to fit your business needs to a "T". You are unique...your needs are unique… Acumatica is flexible enough to fit your operations like a glove. Acumatica goes where your people go, anywhere, anytime on any device...and with unlimited users, you can involve everyone. In nature, clouds are beyond our reach, Cortekx and Acumatica Cloud ERP bring the cloud to you. As Gold Certified Acumatica Partners, we work with you to quickly realize the benefits and opportunities of cloud ERP in your company. Acumatica enables small and midsize businesses to unlock their business potential and grow profitably by providing next generation Cloud ERP and Cloud Accounting Software applications that adapt to their evolving needs. CRM, Finance, Distribution and Logistics, eCommerce, Customization, Business Intelligence and more are all available in a single web browser based and cloud deployed application. 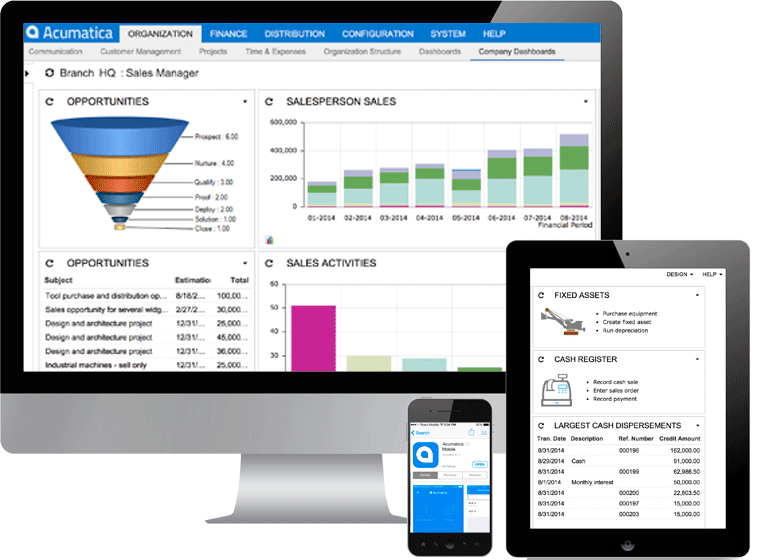 Learn more today and see how Acumatica can help you take control of your business, play to your strengths and empower your people with any device anywhere access. Over 20 years experience and over 100 implementations provide the expertise for us to get you and your staff up and running on Acumatica quickly so you can begin increasing profitability and unlocking your business potential. Learn more about our trusted implementation methodology and how we can get you from where you are today to where you want to go. Anyone can put software on your desktops, but only experience and planning to get you to the finish line.